Mallorca is the largest of the Balearic Islands with a rich and varied terrain, from jagged mountain peaks of the Serra de Tramuntana in the north to patchwork fields edged by drystone walls of the central and southern plains, all surrounded by dramatic cliffs and sandy beaches. Under Moorish rule for three hundred years, Mallorca is now part of Spain, with strong Catalan ties. About one fifth of the population comprises British, German, Swiss and French expatriates, some of whose exceptionally beautiful gardens are included in this tour alongside those of Moorish influence. We have carefully chosen one fine hotel: the Hilton Sa Torre Hotel, restored and refurbished with great attention to detail from the 14th century country estate of Sa Torre, achieving a perfect balance between the traditional style of a Mallorcan Finca and the modern and comfortable style of an international hotel. 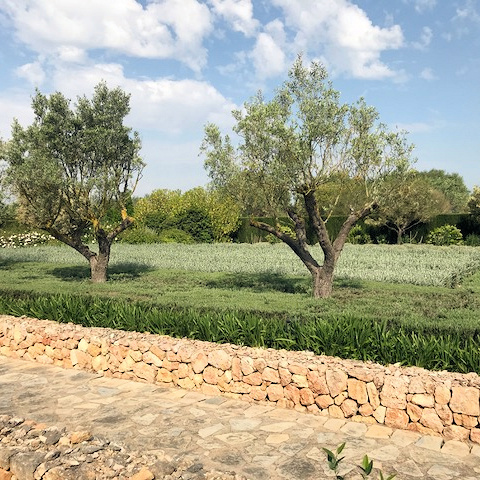 This exclusive EBTS tour will be led by Sally Beale the branch head of the Mediterranean Garden Society, Balearic’s and hosted by EBTS Council member, Charlotte Maclean. Depart London Heathrow at 09:35AM to Palma Mallorca Airport, arriving at 13:00PM on British Airways flight BA0496. Please purchase your own lunch. From the airport, we drive first to the small formal garden of Marivent Palace on the outskirts of Palma. The summer home to the Spanish Royal family where part of the gardens have only recently been opened in the months when the palace is not used, and feature beautiful shaded walkways, fountains, clipped and sculptured shrubs as well as bronze sculptures by Joan Miro, whose former studio is very close. We then take you to the other side of the bay to visit Writers Block: where by special invitation we visit the garden of writer and ex-Member of Parliament, Jeffrey Archer. We drive on to our hotel and after settling in, we meet up for a drink in the old chapel followed by our first evening meal together with wine. We start the day at Jardines de Alfabia. In 1229 King Jaume I rewarded his ally, the Moor known as Benhabet, with a large estate, in gratitude for his help in conquering the island. Benhabet created the lush terraced garden in the Arabic fashion that continues to impress. Further along the road is Sóller Jardí Botànic, a centre for conservation and study of Mediterranean flora, an excellent introduction into the native flora as well as the range of introduced species that thrive on the island. Then, taking the coast road, we drive through Deia, past the former home of writer, Robert Graves, to Valldemossa with some free time in this beautiful small town. Here we can visit the former monastery and one-time home to Frédéric Chopin, the Polish composer and virtuoso pianist and George Sands who wrote “A Winter in Mallorca” about her time on the island. There is time to get your own lunch and to explore the shops. In the late afternoon, we drive down to the central plains to discover Biniagual, a private hamlet lovingly restored to include a contrasting series of small gardens surrounding a sequence of historic homesteads producing excellent vintages. On arrival, we are offered a wine tasting followed by a visit to the gardens and a dinner together. Return to Hotel Hilton Sa Torre. 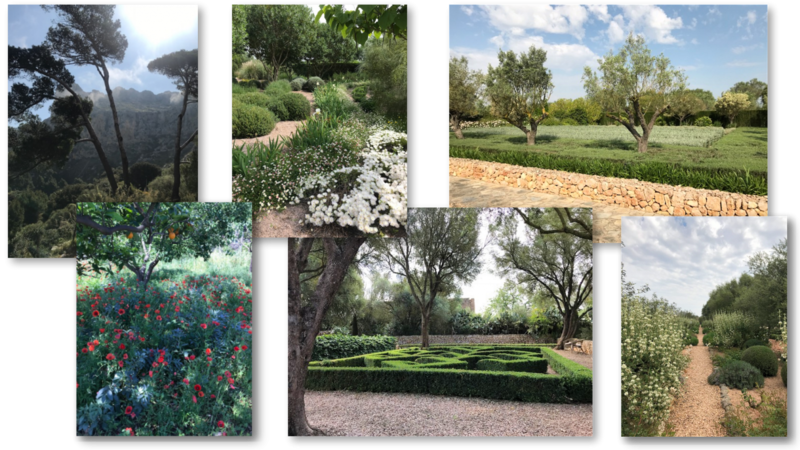 Today, we drive through floral-rich meadows to Son Muleta, the exquisite garden created by Camilla Chandon: a hidden retreat enlivened by rivers of blue-flowering plants studded with olive trees and tightly-clipped silver and green Mediterranean shrubs threaded with climbing roses. Following lunch together at Hotel Son Claret, with time included to see the gardens, we drive into Palma for a walk around the old town to include views of patio gardens, the Moorish baths and wonderful Cathedral. Return to the Hilton Sa Torre for a final dinner together. A duo of delights in the south-east of the Island: Son Muda is the home of Helene & Christian Lindgens who are developing an ambitious and wonderfully intriguing white garden decorated with a host of sculptures by local artist Pedro Flores. After lunch at a local restaurant, we are invited to another very private garden. Return to the Palma Airport for flight BA0451 departing 20:00PM, arriving London Heathrow 21:25PM. The price includes: three nights with bed & breakfast at Hilton Sa Torre; two evening meals with wine at the hotel and an evening meal plus wine tasting at Biniagual; two lunches with local wines; and return flights from London Heathrow. Those wishing to make their own flight arrangements should state this on the booking form and we will deduct £233 per person from the tour price. Please note that hotels used by Boxwood Tours are invariably hotels of character featuring a variety of rooms & styles. The price does not include extras at the hotel or travel insurance. A deposit of £250 per person is required to secure your place. Card payments can be made by phone using a Visa, Mastercard or Maestro card.